In recent years, quinoa’s popularity has soared as a replacement for starchier pastas and rice. It has a pleasant mellow, nutty taste and is available in several varieties such as white, red, black or a combination of the three, tricolor. A superfood, quinoa is high in protein as well as iron, magnesium, and fiber. I recommend pseudo-grains like quinoa, millet and buckwheat on the Candida diet, instead of regular options like wheat, barley, or rye. This is because they are completely gluten-free and tend to be much easier on the gut. If you’re suffering from poor gut health, the last thing you need is to eat pro-inflammatory foods that will inflame your gut lining even more. There is more and more evidence showing that gluten has negative effects on gut health, even for those who are not Celiac. If your gut flora is already imbalanced (due to diet, antibiotics, or some other reason), you should avoid gluten and other pro-inflammatory foods as you follow the path back to a rebalanced and restored gut. 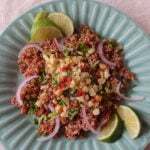 You can serve this quinoa with some healthy protein like chicken or beef, or in place of rice with any of your favorite Asian dishes. This Thai version would make a nice accompaniment for our Grilled Chicken with Bok Choy or Thai Red Curry. I hope you enjoy it! Place quinoa, unsweetened coconut milk, water and salt in a medium saucepan and bring to a boil over high heat. Reduce heat to low, cover saucepan and cook quinoa for 15 minutes. Remove saucepan from heat, keeping quinoa covered for 5 additional minutes to absorb remaining liquid. Fluff quinoa gently with a fork, set aside to cool slightly. In a small bowl whisk together coconut aminos, lime juice and ginger juice, season to taste with salt if needed. In a large bowl add quinoa and coconut amino/juice mixture, toss to coat. On a serving platter arrange in layers quinoa, red onion slices, minced cilantro and Thai basil, crushed macadamia nuts and pink peppercorns. Serve with lime wedges. 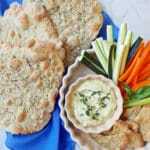 Looking for more gluten-free, sugar-free recipes? Our Ultimate Candida Diet program contains more than 100 delicious recipes, plus lots of valuable advice on which foods to eat and avoid. Find out more here. Wow, this is such a great recipe! There’s not enough water/coconut milk in this (double it!) otherwise it’s. fantastic recipe! Thanks. Love this recipe!!!! Even my husband who hates healthy food liked it. I added green and red peppers, garlic prawns and doubled the water and coconut water! Delish!!!!!!!! !